Ms Churchill, who was herding cows at the time, jumped off the slow-chugging bike and the koala kept after it, climbing onto a wheel as if it were a eucalyptus tree. The koala then looked back at Ms Churchill as if to ask what all the fuss was about.Koalas are tree-dwelling marsupials that are native to Australia and a hit with tourists because they appear to be cute and cuddly. Holding a koala - which are usually extremely docile, do almost nothing but munch eucalyptus leaves, and sleep up to 22 hours a day - is a very popular attraction at zoos and parks across the country. 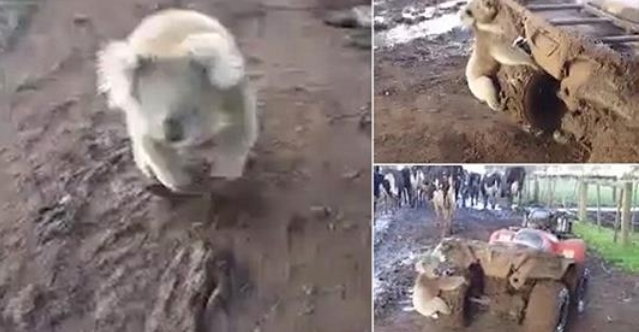 Responses to "Koala chases woman's slow-moving quad bike down a muddy road… then gives it a hug"